What could be better than curling up with a mug of hot chocolate and a pile of Christmas movies such as Elf, Miracle on 34th Street and *record scratch* Deadpool?! 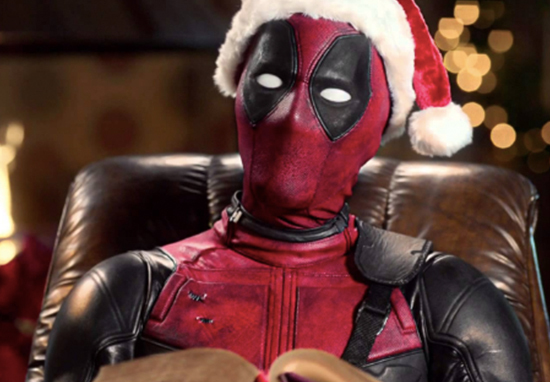 It seems the Merc With A Mouth will be slipping down your chimney this Christmas to fill your stocking with wise-cracking commentary and pop culture references. 20th Century Fox have announced an untitled Deadpool movie will arrive in cinemas on December 21. Not much is known about the film as yet, with the studio reportedly encouraging fans to take a guess. Now, Ryan Reynolds has tweeted a very telling picture of himself, which will be hilarious to those of us who have fond memories of watching childhood classics on snowy days. Simply captioned ‘thoughts?’ the photo shows Deadpool wearing a jaunty Santa Claus hat and reading a story to actor Fred Savage, who’s all tucked up in bed. As an adult, Savage has appeared in popular shows such as Friends From College and BoJack Horseman, but as a child he starred in a film which touched all our hears. Fans of The Princess Bride will recall how Savage played the unnamed character of the grandson in the fantasy adventure, whose grandfather (Peter Falk) reads him a story while he’s poorly in bed. At certain points in the narrative, the grandfather leaves out some of the scarier bits to ensure it’s age appropriate for the sick boy. The grandson also gets grossed out by some of the ‘kissing bits’, which his kindly old grandpop skips over at his request. However, in an adorable bit of character development, little Savage doesn’t mind the romantic, slushy stuff quite so much once he gets to know and care for the characters. Sources have now indicated to Collider this upcoming Deadpool film will be PG-13, in a stark contrast to the explicit R-rating we’ve come to expect from this rude and raucous superhero. So, one could gather from this picture Wade Wilson will be taking a leaf out of the grandfather’s book, skipping over some of the naughtier and gorier parts of the Deadpool story to keep things family friendly. Approved. My childhood memories were too PG anyways. Love that scene in the book. 2 Deadpools is the best. It'd be nice if Deadpool 3 deals with his legs have grown a tiny baby upper body. Also…kinda scary Santa over his shoulder. It’s not yet understood whether this new Deadpool instalment will recut footage from both films in the series, or whether there’ll be more of a focus on Deadpool 2? However, fans have plenty of their own theories as to what we can expect from Deadpool’s Christmas greeting, with many thoroughly enjoying the universes of Deadpool and The Princess Bride colliding. It’s the union we never even knew we needed. This is like the movie version of combining chocolate and peanut butter! "You…you don't wanna hear our thoughts on this…there's a lot of eating of fries and such in this part of the story. Maybe when you're older." Hold it! Hold it! What is this? Are you trying to trick me? Where's the sports? Is this a kissing book? Deadpool can read me a bedtime story anytime! Also, he’d make a great Santa Clause. I'd love if Marvel did an abridged version of "The Princess Bride" With Deadpool as the grandpa. But also played the guy who got the girl in the end. Grandfather: Nah, it's kissing again. You don't want to hear it. This certainly is as I wish.